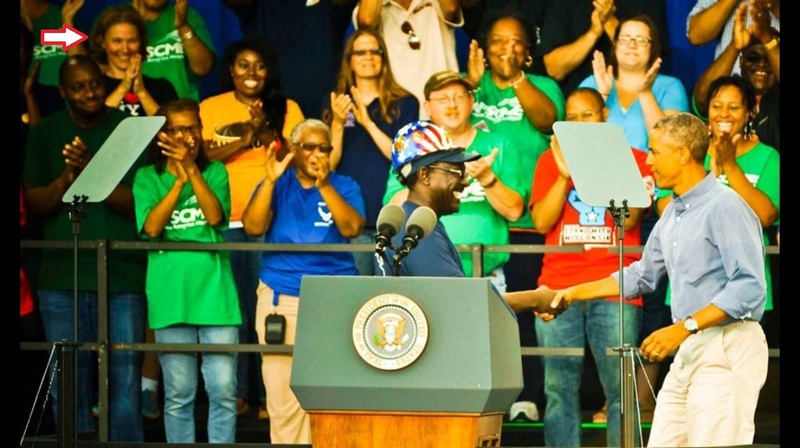 West teacher Tanya Lohr was invited on stage during President Obama’s Labor Day speech. On Labor Day, Tanya Lohr’s patriotism soared like a jet as she was living out a once-in-a-lifetime moment with the president of the United States. “I had just started getting used to being on the stage in front of the huge crowd when suddenly Air Force One flew by and my stomach jumped, my knees buckled and my eyes started to tear with pride,” said Lohr. Lohr, a social studies teacher at West Bend West, was given the opportunity to stand up on stage with President Barack Obama. The president was in Milwaukee at the Summerfest Grounds on Labor Day, Sept. 1. Obama gave his Labor Day speech to a crowd of about 6,000 and emphasized topics such as union workers, job growth, and the economy. “It’s an honor to have someone from our school represent the school district. [Lohr] is a valued staff member and works well with children,” said Bill Greymont, principal of the West Bend High Schools. Lohr said she arrived at the Summerfest Grounds around 10:30 a.m. The president would not be on stage until 2 p.m., but over the course of the next 3 1/2 hours those going on stage with the president were checked and prepped for his arrival. “The long period of time between arriving on the grounds and actually greeting the president gave us plenty of time to acclimate to the situation,” Lohr said. “Each time it started to feel ‘normal’ to be on the stage, I was given reminders of just how atypical this was,” Lohr said. She recalls being more relaxed when the president was on stage because of his down-to-earth manner and because he was very gracious with everyone around him. Lohr has taught for the past 16 years. She currently serves as the chair for the Democratic Party in Washington County and in 2012 Lohr ran for Wisconsin Senate. She has advocated for workers’ rights and adequate funding for education. Her political work for the state is what granted her the opportunity on Labor Day. “There has been an outpouring of congratulations from friends and family and community members who saw my experience as an honor for all, not just one,” said Lohr. Lohr said that she was thrilled to have such an experience to share with friends, family, and students. “In the end, it truly was fun and I thoroughly enjoyed being part of history,” Lohr said. Thank you for this wonderful article! Beautiful job.